On the fifth day of Christmas ... the Tories gave to us ... Austerity! This was one of the verses of the carol, 12 days of Christmas, sung by protesters to the shoppers of Woking during a 300-strong protest on Saturday 15th December. Other verses included 'Surrey Fire Service Cuts', 'Less Buses Running', 'Special Needs Neglected', and more. Raising the profile of Save Our Services in Surrey (SOSIS) and the fight to defend public services, were firefighters, nurses, social workers and carers, teachers and teaching assistants, librarians and railway workers - all stood united as public sector workers to say a resounding No to austerity and to demand a general election. 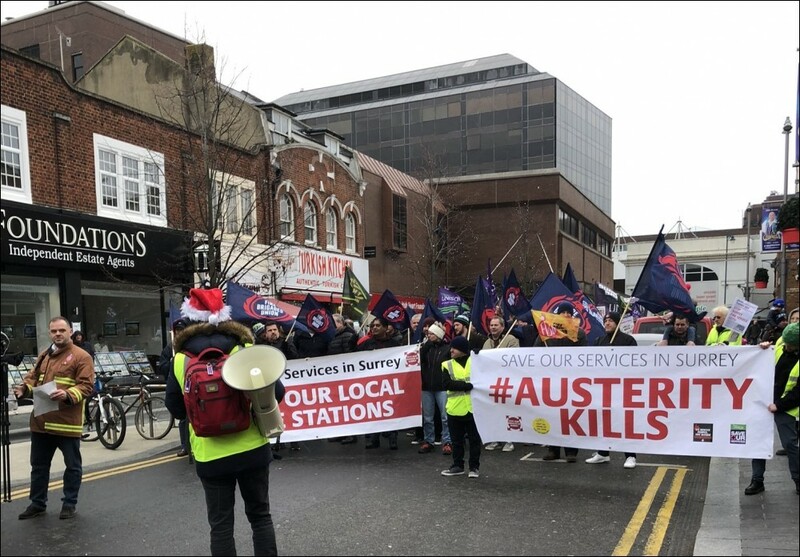 Also joining the protest march around Woking town centre were local Labour Party members, Socialist Party members, Greens, independents and a small group of Lib Dems. 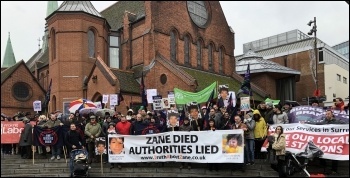 Kye and Nicole, parents of little Zane Gbangbola who died in the floods of 2014 were also there supporting the protest with their 'Truth About Zane' campaign and their banner which read: 'Zane Died - Authorities Lied'. "Someone is going to die because of these cuts. 'Austerity Kills' is the title of this protest because cuts kill. Whether it is cuts in the fire service, police or ambulance services meaning slower response times to emergencies, or cuts in the number of mental health hospital beds, or cuts in social care for vulnerable elderly or disabled people. Political decisions have consequences and austerity is a political choice. 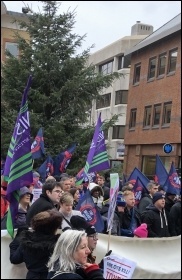 "This has been a magnificent show of strength and solidarity by the Surrey trade union and labour movement. People may think Surrey is just stockbrokers and rich bankers but there are hundreds of thousands of ordinary working class people who live and work in this county - many of whom work hard to provide our essential public services with less and less resources. 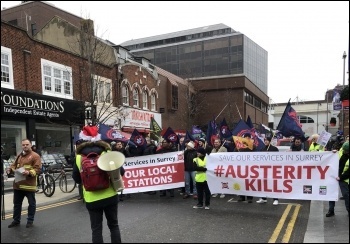 "The next steps for SOSIS will be to encourage people to participate in the council consultations over the cuts, making sure Surrey County Council knows the strength of public feeling. We will then be ready to respond to any threatened cuts to libraries, children's centres, special educational needs services (SEND), social care or any other cuts or closures. "We will also be pulling together a people's assembly against the cuts in the new year - involving all of the local trade unions, all the opposition parties and residents and community groups - to develop a people's manifesto and budget for Surrey, based on what is needed, not what the government allows us to spend. We will then go into the next council elections demanding all candidates adopt this budget and make a stand against the cuts". Another Christmas Carol which was ringing in the air on Saturday was: "Jingle bells, Jingle bells, Jingle all the way - What do we want for Christmas? The back of Theresa May!" This version of this article was first posted on the Socialist Party website on 18 December 2018 and may vary slightly from the version subsequently printed in The Socialist.